Server virtualization is the computing wave of the future, with virtual machines taking the place of larger server rooms and streamlining the resource management process. Virtualization has been around for quite some time but it’s becoming increasingly popular in the enterprise, so now is the time to get on board before you get left behind. Recently, I decided to really start learning how to work in a Linux virtual machine environment so that I can learn more about cloud security. As a result, I ended up buying a more powerful laptop, which is why I decided to help you find the best laptops for virtualization so that you can have an easier time than I did. Virtualization let’s you do some cool things, so with that said, let’s get into what you’ll need to get started. Virtualization is one of the most computationally-intensive processes that you can engage in on your new machine. If you’re going into security like I am, you’ll need programs like Kali Linux for penetration testing and when you’re doing this, a multi-core machine is integral. While you won’t get any more cores than four on a laptop today, this is generally enough for most virtualization needs. As a general rule, with two cores or so, you’ll also have a harder time distributing your processing abilities across your virtual machines. Remember, when you are running a series of virtual machines, they are pooling their individual resources to benefit the entire server structure, so the more cores on each node, the more processing and computational power you’ll have to work with. A good choice for a mobile processor will be an i7 or greater CPU. You can select a sixth/seventh generation i7-6700HQ or i7-7700HQ and be pretty good to go on your virtualization laptop. Since you’ll be shooting for multiple cores, you’ll definitely need a lot of RAM so that your access times aren’t bottlenecked by memory limitations. While VMware suggests 4 GB of RAM, I feel that 8 GB of RAM is better or more. In fact, outside of heavy duty encrypting or Hadoop work, virtualization is one of the few fields where it’s perfectly reasonable to have a machine with 64 GB of RAM. 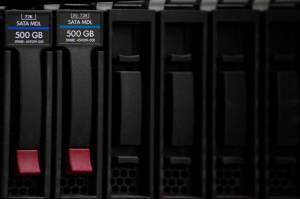 While outright capacity isn’t the most important factor in purchasing a virtualization machine, you should have at least a terabyte drive to manage your shared storage framework. One of the chief considerations that you should make when considering your storage is what kind of drive you want. For my money, solid state drives have some key advantages over traditional mechanical hard drives. The chief one is the fact that solid-state’s access times are lightning fast in comparison, which means that your virtual machines will boot much faster. Also, when it comes to solid-state drives, for virtualization, an M.2 PCI-E NVMe SSD is slightly better than a SATA-based SSD. In fact, NVMe SSDs run significantly faster than the other type but are also a bit more expensive than SATA as well. If you want to do some virtualization, then you’re going to need a larger machine. Not only do larger laptops have larger displays, which is advantageous when running programs and security applications, but they also tend to have num pads, which are also useful when you have to do some programming. Additionally, larger machines are also more friendly for upgrading. Need more RAM? A larger laptop is more apt to have upgradeable memory and storage. Since you’ll be running some component intensive processes on this new laptop, a larger system will also benefit you because larger systems don’t cut down on cooling. Simply put, with a more robust structure, a larger system simply will handle the stress much better than the thinner systems that are popular today. In all honesty, this is probably the least important component of a virtualization-ready laptop. That being said, if you plan on doing any gaming on your new laptop, shoot for the current gen Nvidia Pascal 1000-series GPU. Additionally, systems with these kinds of chipsets can actually benefit your virtual machine by providing CUDA technology that can actually add a bit of computational power to your virtual environment. Over the years, one thing I’ve learned is that in most situations, powerful processors and graphics cards will greatly hinder your overall battery life. It’s for this reason that gaming laptops tend to only last a couple of hours when not plugged in. Despite this, the Lenovo IdeaPad 700 is very impressive. Its Intel i7 6700HQ is a fairly powerful processor from the last generation that has a quad-core architecture. Somehow, Lenovo was still able to build this laptop to last about six hours under mild load, which is an impressive feat. As the most budget-conscious of the laptops that I’m featuring here, this IdeaPad has some great features including a two-drive setup that combines a 250 GB SSD for booting and programs and a 1 TB HDD for file storage. The biggest caveat with this system, in my opinion, is its soldered-on battery, which can’t be replaced when it goes. With 32 GB of RAM, the ASUS ROG STRIX GL553VD-DS71 has a lot of memory for what is effectively a gaming rig. Add to this its very impressive Intel i7-7700HQ, its spacious dual-drive setup, and its Pascal 1050 GPU and you’ve got a fairly performant machine here that doesn’t cost a whole lot. Its i7-7700HQ is current generation, which means that you’ll get robust performance. It has four computational cores, a max turbo frequency (clock speed) or 3.80 GHz, and a 6 MB cache. Put this processor together with the Nvidia GTX 1050 GPU and you’ve got a lot of computational power thanks to Nvidia’s CUDA technology. Of course, as a gaming-oriented machine, you can also expect to sacrifice a bit of battery life with this; it only lasts about four hours or so. Despite this limitation, the combination of the fast processor and the 32 GB of RAM means that this laptop will have the ability to host more virtual machines and work faster. As we get into the big leagues, it’s important to note that a few of these machines, like the last one, can be considered “gaming laptops.” While you might not see the convergence between virtualization and gaming, these machines are typically very powerful, which makes them definitely ready for the virtual machine environment. The MSI GS43VR is definitely built for gaming, but its excellent components make it great for just about any processor-intensive application, which definitely includes virtualization. It has the same Intel i7-7700HQ as our previous machine, but its Nvidia GTX 1060 and its CUDA computational enhancements are what will make this a great machine for your virtual machine configuration. Additionally, this laptop has an in-plane switching (IPS) display that is crystal clear and has great brightness and contrast. Add to this the presence of a half-terabyte solid state drive and 32 GB of RAM and you’ve got a fairly speedy machine. It only falters, in my opinion, in its size; it’s only a 14-inch laptop, which can fit your needs or be a hindrance. The Omen 17 is a powerhouse system that incorporates a ton of space (a half terabyte PCIe SSD and 2 TB of HDD storage), an exceptional GPU (Pascal 1070), and loads of RAM into its stylish interior. Also powering this gaming-oriented machine is the same i7-6700HQ that we covered in our first machine. If you’re looking to run a Hadoop node for big data and virtualization, then there aren’t many machines that are more capable than this one. It has a good processor with a great GPU so that you can leverage CUDA computational power as well. While its battery life is fairly disappointing as it only lasts for about four hours, I really like the fact that you can actually upgrade the RAM and the solid-state drive in this machine in the future. That being said, you can’t replace the battery and the Omen 17 doesn’t incorporate a USB 3.1 C into its design. Whew! We are finally here, the “cream of the crop” so to speak. At $3,000, you can expect the Lenovo Thinkpad P50 to be a very high-performance laptop. In fact, Lenovo has something of a reputation for providing some great machines for enterprise level IT specialists. You simply can’t knock the build quality of this machine and with its top-notch components, you’ll be happy using this in your virtual machine environment. One of the reasons why I like this so much is because it is more of a mobile workstation rather than a traditional laptop. It has a professional-grade Nvidia Quadro M2000M graphics processor with 4 GB of video RAM, a powerful quad-core i7-6820HQ, and it also has a full 64 GB of memory. It even has a two terabyte solid-state drive. It’s a bit dim and its speakers aren’t the greatest, but it’s still a very impressive machine. It’s definitely time to consider virtualization; it’s the wave of the future and it’s only going to grow in its vitality in business. Each of the machines that I covered here is excellent for virtualization, so review each again and decide which works best for your needs. If you ever need additional feedback or have any questions, pop a comment down below; I’ll be sure to get back to you. Hello,I check your new stuff named “Ultimate Guide to 5 Best Laptops for Virtualization in 2017 – Pick Notebook” regularly.Your humoristic style is awesome, keep doing what you’re doing! And you can look our website about daily proxy. Thank you. It was helpfull. Hi, I am a college student in need of a laptop that will do well for cybersecurity and CS classes. However my budget is around 800, and I’d like some advice on what the best choice would be. I’ve been looking at the Dell XPS but for my price range I’d only be able to get i5 and i would like i7. I’ve also been checking out the HP pavillion.